The phone rang yesterday. I wasn't home, so the blinking red light on the answering machine called to me when I returned. As I listened to the recording, a tousled blonde voice jerked my heart back half a century to a silver-grey Vespa piloted by a six foot tall teen Adonis. 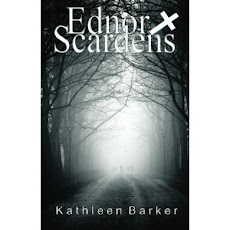 He called to find out when "The Body War" - the sequel to my book, "Ednor Scardens" - would be available. The first time he read it out of curiosity, wondering what lay between the covers of a story written by someone he knew. Satisfied, he put it aside until recently, when he read it again more slowly, dissecting the clues buried in the main characters: a certain phrase, an expressive description, or a setting that no longer exists. Unable to resist, he had to ask how much of himself had been poured into the young alpha male of the story, Michael Kelsey. He is still happily married to his lovely wife with whom he has several adult children. 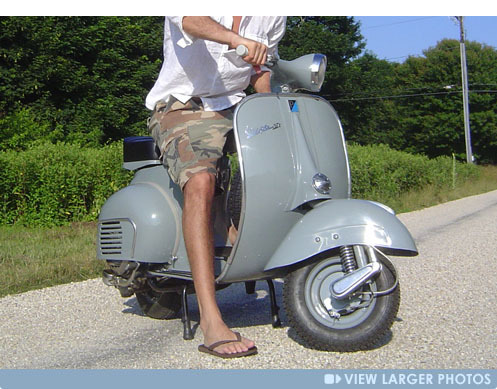 I am not, having unwisely married my childhood off-again, on-again boyfriend who had traded me in for a newer model some years back, so I couldn't help a bittersweet 'what if' moment. My caller had been the love of my life when I was fifteen, until an unfortunate convergence of misunderstandings brought our relationship to an abrupt end. We were at a dance and a mutual male friend approached during a band break. "I always wanted to go out with you," the friend said, out of the blue. Caught off-guard, I blurted what I thought was a polite reply. "I always wanted to go out with you, too." And the evening spiraled out of control from there. The traitorous boy wasted no time repeating my meaningless (to me) comment to Tousled Blonde, who announced in a wounded, aggrieved voice, that I was now free to do exactly that. Weeks of varying degrees of anguished tears followed as I banished myself to my tower on Rexmere Road, sadly writing his name in bubble letters in my wire-bound spiral notebooks. We both moved on, to very different lives and parts of the country, until I saw him again last year when he stopped by unexpectedly to pay his respects at my brother's funeral. Still handsome and remarkably unscathed by time, he told my sister-in-law that I once had the ability to stop traffic by simply standing on the curb. Well, lots of women have that effect, and make a lot of money at it, but his rose-colored assessment still made me blush. Even as I compose this, the strains of the songs we danced to...the Ronnettes' "Be My Baby'' and James Brown's "Try Me" float softly through my brain. I told him that the character, Michael, was a composite of boys I had known: the star athlete, the wealthy son, the cheat, among others. He was not those. But the devilish humor, kindness and compelling good looks...well, I've been outed. Now I'm going to be embarrassed, wondering what he'll think as the characters mature into more adult activities in the four-book series. As the afterglow of the Loyola University (MD) Cinderella story begins to cool, much has been made of the unlikely convergence of talent at the small Jesuit school at the corner of Cold Spring Lane and Charles Street in Baltimore. It is a testament to the deep roots the sport has in the Free State. Although the game was first documented by Jesuit missionary Jean de Brebeuf in Ontario in 1636 when he observed the Huron tribe playing the strange sport, other tribes throughout the U.S. and Canada were also playing “The Creator’s Game”. The Iroquois played it for the enjoyment of The Creator and, in special ceremonies, to heal tribal members. But it was the French Jesuits who dubbed the webbed stick “le jeu da crosse” for its resemblance to a shepherd’s crook or a bishop’s crosier. It took another quarter of a century before W. George Beers set down the rules, standardizing the game. And that was fifteen years after then-Loyola College had been founded. Through the years, Loyola University of Maryland has produced a wealth of fine athletes, in spite of its lack of big money and endorsements. The emphasis is on producing students grounded in spirituality and the Jesuit tradition of service to their fellow man. Recruiting isn’t always easy, competing with the powerhouse machines of much larger universities like Duke, UNC, University of Maryland and many others. 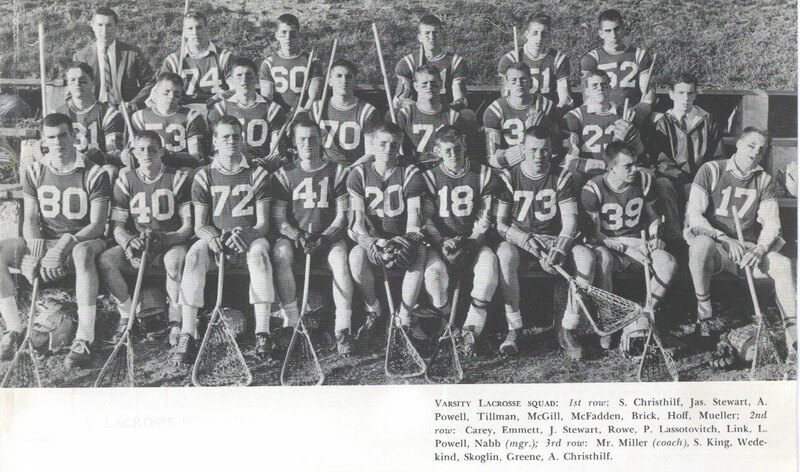 Still, this small, private, catholic school has produced over 90 All-American men’s lacrosse players since 1959…and the number is higher if you count the players who were named over multiple years such as the Greyhounds’ coach, Charley Toomey in 1989 and 1990. Looking over the long list, I recognized several names from my own college years and, in a “where-are-they-now” moment, I decided to track one down. 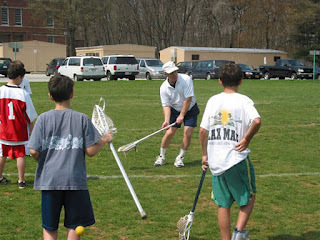 His name is John White, All-American lacrosse middie from 1967. 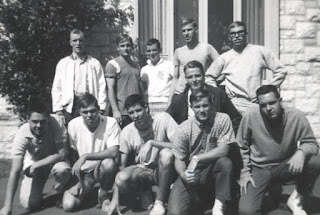 One of the most natural athletes of the 1960’s, John played three sports as a 14-year-old freshman: football, basketball and baseball at Loyola High School (Blakefield) during ’59-’60, a year that brought state championship titles in all three of those sports. He modestly describes the achievements as “harmonic convergences, where a couple of outstanding coaches accidentally hooked up with a couple of outstanding players”. He doesn’t include himself in that group, saying that the championships weren’t due to any efforts on his part. 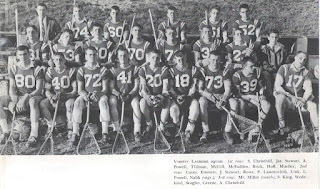 But the real significance of that year was the introduction of lacrosse to Loyola High by coach Eddie Miller and, aided by Gene Corrigan, the enthusiasm that the men brought to the “new” sport made John White want to be both a player and a coach. Intrigued, John dropped football and basketball in his sophomore year, concentrating on lacrosse and baseball. He laughs when asked about his lacrosse beginnings. And John’s “stupid moves” worked so well that by his senior year, he was named All Maryland midfield. Ever-humble, John feels the reason for his lacrosse success was dominated by conditioning. John White’s favorite game of his college career was also his last. So what has life held for All American John White since his glory days as a ‘Hound?